Get the STORM Overseas App! Where would you look to if you wanted updated and correct information on studying abroad, living abroad, working abroad? Would you google it all? Or check for forums to look up your question on the internet? Why not, go to STORM Overseas app instead? 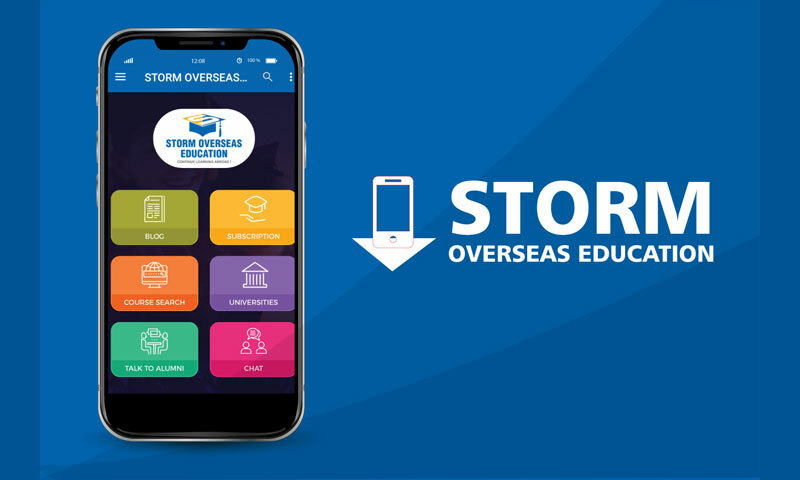 Yes, on 14 December, STORM Overseas is re-launching the App with added features and more benefits for tudents, where you will be able to find all the information you need under one roof. Here are some of the key features of the app. Choose your preferred country, broad subject area and level of study and voila, you will find loads of fantastic options listed for you. You can sort them on the basis of tuition fees, location and other parameters. Did you do very well in your previous school/university exams? The great news is that scoring well in your previous qualification could make you eligible for generous merit-based scholarships. Plug in your details into the scholarships search database to find funding you’re eligible for. It’s all well and good reading the university’s website or leafing through the prospectuses; but these don’t tell you much about the ground realities. This is why we’ve introduced the ‘Talk to Alumni’ feature, using this you can get in touch with students who are currently pursuing studies (who have applied through STORM Overseas), or those that have graduated and can share useful tips and ideas on almost any questions you may have regarding your studies at the universities of your choice, options or even as simple as questions pertaining to living and working abroad. When you’re considering to study abroad, it’s vital you stay up-to-date with the latest developments in your country of choice and the world in general. To help you do these, we publish regular blogs on topics of education and careers. A great way to keep reading these blogs (like this one!) is by using the STORM app. Do you have any questions? Well, why don’t you post them in the Chat screen? Either a STORM counsellor or one of STORM alumni will get in touch with you to answer your questions. Save the best for the last, There’s the daily quiz, (amongst other competitions we will roll out eventually), through which you can win some cool prize money and other goodies every single day. You can earn through referrals too. So download the STORM Overseas App and start winning. So, what are you waiting for? Download the STORM app from your phone’s app store now!